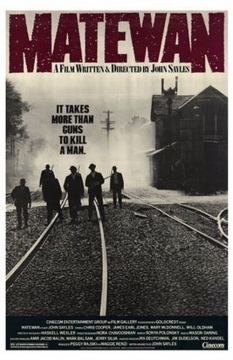 Synopsis: John Sayles, one of the leading independent directors in the world, came to WV in 1983 to film one of the most famous confrontations between laborer and owners in the town of Matewan, Mingo County, WV, 1920. It took him four years to finally finish the film, directing “Brother from another Planet” during that time period. Coal miners, struggling to form a union, are up against company operators and Baldwin-Felts agents. Black and Italian miners, brought in by the company to break the strike, are caught between the two forces. Union activist and ex-Wobbly Joe Kenehan (Chris Cooper), sent to help organize the union, determines to bring the local, black, and Italian groups together. Drawn from an actual incident; the characters of Sheriff Sid Hatfield (David Strathairn), Mayor Cabell Testerman (Josh Mostel), C. E. Lively (Bob Gunton) , and Few Clothes Johnson were based on real people. James Earl Jones plays Few Clothes Johnson, a black coal miner who joins the union to stop massive abuses. The execution of Sheriff Hatfield on the steps of the McDowell County Courthouse steps by Baldwin-Felts agents led to the 1921 Battle of Blair Mountain, the largest armed labor conflict in American history. Music by WV native Hazel Dickens. Nominated for an Oscar by Haskell Wexler for best cinematography. Filmed in Thurmond and the New River Gorge, WV. In this scene, Chris Cooper’s organizer character gives an impassioned speech about the meaning of being in a union, with an explicit attack on racism and other forces that would divide workers.